With 125 scientific papers published on the study to date, this project is helping researchers and families understand the genetic causes of the disorders. This helps the family access services and can inform their child's treatment. "Correct diagnoses for families with rare developmental disorders are really important for helping them understand the disorder and for guiding future care. It is crucial that people have access to clinicians with expertise in rare disease, who can ensure the genetic results really do explain the child's clinical problems and provide information and support to their families," says Dr. Helen Firth, Consultant Clinical Geneticist at Cambridge University Hospitals Trust, and Honorary faculty at the Wellcome Sanger Institute. "As a result of the DDD project thousands of children with rare neurodevelopmental disorders now have a diagnosis, and their families can use this to inform their decisions about further children and to guide and target appropriate medical care. Collaborators meetings informed and educated the clinicians, and the scientists were able to understand the enormous impact their work had for the families in the research. 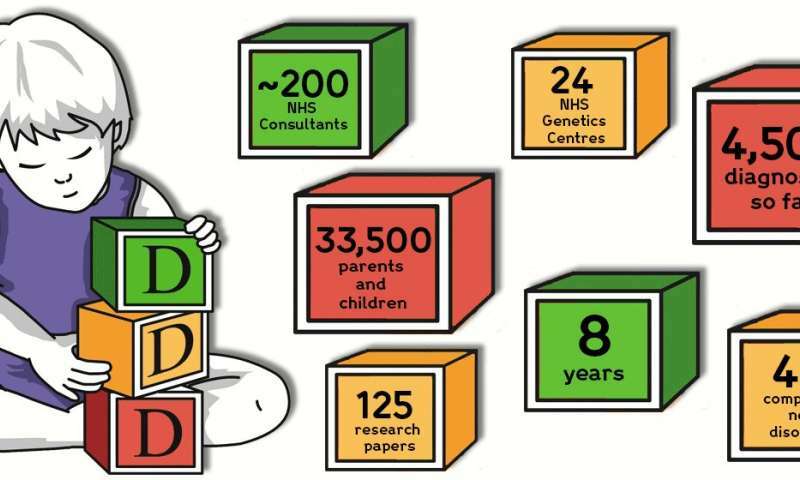 This collaborative approach establishes a model for genomic medicine that can guide the new NHS England genomic service," says Dr. Jane Hurst, President of the UK Clinical Genetic Society and lead for the DDD project at Great Ormond Street Hospital.